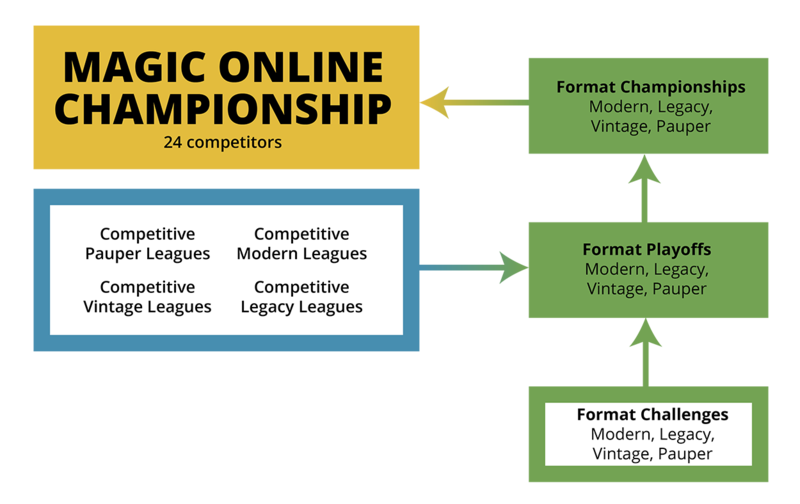 The Magic Online Championship Series (MOCS) is a venerated institution in the Magic Online community. It's where many of today's best players (such as Reid Duke, Brad Nelson, and two-time MTGO Champion Dmitriy Butakov) broke into top-level play. It's the pillar of MTGO premier play. And it's where we give away $250,000 in prize money—$50,000 more than the 2018 Championship! Beyond the prize update, we have some other exciting changes to the MOCS to announce. The bottom line is that there are more ways to play the formats you love and get rewarded for it. The full rules for the 2019 MOCS year are here, but if you just want the highlights, read on. On December 2, at 8 a.m. PT, the last MOCS Monthly event of the 2018 season will begin. That's your last opportunity to use those 2018 Qualifier Points. At the same time as that final event starts, all QPs earned from that point forward will count as 2019 QPs. We'll still need to remove all the 2018 QPs, and that'll happen on December 5. When we do that, though, we'll put back any QPs you've earned for 2019. Your collection will have a total that includes both for a few days, but after we come up from the December 5 downtime, your QP count will be correct. With those QPs, you won't be entering MOCS Monthlies anymore. In the 2019 season, they're going to be called MOCS Preliminary events, or MOCS Prelims. When there's one every other week(ish), they're not really anything remotely monthly. We hope this change will better solidify the terminology we use around events and make things clearer. Starting in the 2019 season, you'll be able to earn MOCS Leaderboard points from MOCS Opens. We're still inviting seven players from the Leaderboard, and you'll be able to earn those points from Playoffs and Preliminaries as in years past, but if you find yourself nearing the end of the year and want to earn those last few points to put yourself in the lead, you'll be able to hop into an Open for a chance to earn those last few points. Easily the biggest change, the brand-new Format Focus events take the existing Format Challenge events and turns them into the first step in premier play qualification. With Format Focus events, you can play your favorite format all the way to the Pro Tour. Yes, this means that Magic Online players will get to qualify for the Pro Tour playing Pauper. Or Vintage. Or Legacy, or Modern. Choose your format, succeed in it, and you can ride it all the way to the top. The paths to the Magic Online Championship can be seen in the charts below. Format Points (FPs) come from two sources: competitive leagues and Format Challenges. These points are totally separate from one another; your Vintage Points won't help you qualify for a Pauper Playoff event. This chart tells you how you get them. As with MOCS QPs, the target is 35, so if you win one of the weekly Format Challenges, you're all set. FPs don't expire until the end of the year, so if you don't get to 35 by the time the first Format Playoffs roll around, you can finish up by the next one. Or the one after that. The Format Point objects won't be in the system until Ravnica Allegiance, though. But you'll be able to start earning them with the 2019 MOCS QPs all the same. We'll be tracking them, and when Ravnica Allegiance releases in January, we're going to grant all the earned FPs to each player's account. Once every three months, the regular weekly Format Challenge will be replaced by a Format Playoff event. Format Playoffs require 35 FPs to enter (but no tix or Play Points), have enhanced prizes compared to a normal Format Challenge, and send the Top 8 to the Format Championship. 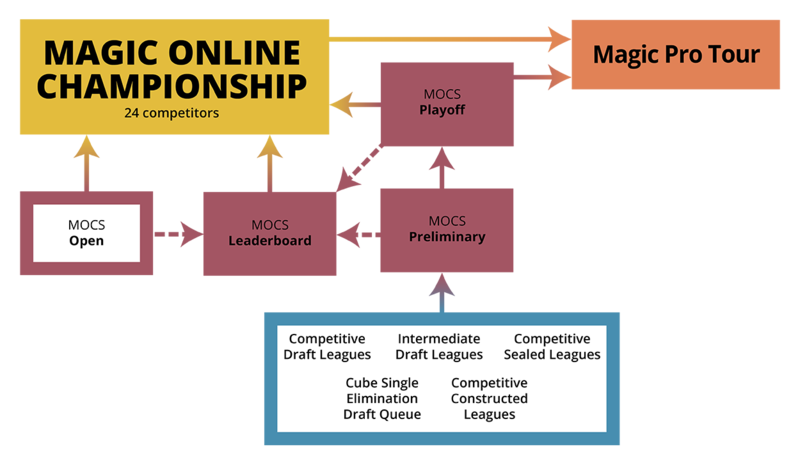 The full year's schedule for the Format Playoffs can be found on the MOCS 2019 page. Format Championships will have up to 32 players and are five rounds of Swiss with a cut to a Top 8 playoff. The prizes for the Championships are significant: everyone is walking away with at minimum eight Draft sets of boosters, 200 play points, and a Format Championship Avatar. Win the whole thing, and you're going to the Magic Online Championship and the Pro Tour, on top of collecting five copies of a Standard-legal set and a 1,000 Play Points. Format Championship Avatars are brand-new, untradeable avatars that you can only get from playing in the Format Championship. All we can say about them right now is that they're going to use art from iconic cards in that format, and the exclusivity will mean they'll let you show off your abilities even more than a mythic rare prestige avatar. We'll have more details on them later. Starting this Wednesday, November 14, Magic Online will have a Competitive Pauper League alongside the Friendly Pauper League. The new league will have the same structure as the other Competitive Leagues, including providing QPs. And when December 2 rolls around, it'll start awarding Pauper FPs as well. We want to caution that this is an experiment. Pauper is a successful format with a passionate player base—which is why it is one of our Format Focus events. We worry, however, that splitting the player base may not work in the long term, so we'll be monitoring League participation rates. If it turns out that format participation doesn't support having two healthy Leagues, we'll retire the Friendly league. You'll notice that the Format Challenge for 1v1 Commander wasn't mentioned anywhere. That's deliberate. Unfortunately, participation in 1v1 Commander events has lagged behind other formats. For a while, this was fine. We were cautiously optimistic. We tried changing the banned list a few times, and that didn't vitalize the format how we were hoping. As a result, all event support for 1v1 Commander will end with the release of Ravnica Allegiance in January. You'll be able to play 1v1 Commander in casual games as much as you like, though. For the 2019 MOCS, Pro Tour invites earned from MOCS events no longer include an invitation to the Pro Tour Challenge. To offset this change, we've increased the prizes for the championship event itself. Our goal with the changes is to focus on what Magic Online does best. Our biggest strength is that we offer faithful Magic play using nearly the full back catalog that Magic has to offer. So, while we'll still be offering Standard and current Draft sets, you'll see us focus on the experiences you can only have on MTGO: more cubes, more flashbacks, more Chaos Draft, more other wacky formats, more competitive Eternal formats. Or as we like to put it: more cards, more formats, more Magic.